Connect with dozens of campus service providers to get new ideas, find support, and learn about resources and services. 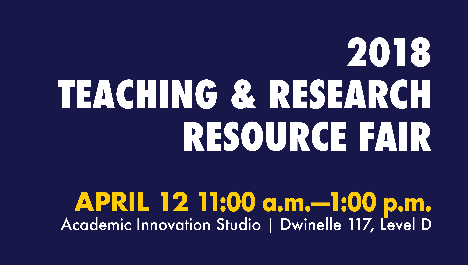 Enjoy focused conversations and technology demos while chatting with other instructors and researchers. Topic tables and demonstrations will run every half hour from 11:00 a.m. to 1:00 p.m. Check out our website for complete information. American Cultures Center, Arts+Design, Basic Needs Committee, bConnected, Berkeley Research Computing, Berkeley Resource Center for Online Education (BRCOE), Center for Teaching and Learning, CSS-IT, D-Lab, Data Science Education Program, Digital Humanities, Disabled Students Program, Division of Equity & Inclusion, Educational Technology Services, Jacobs Institute for Design Innovation, Library, Media Resources Center, Office of Undergraduate Research & Scholarships, Open Berkeley, Public Service Center, Research Data Management Program. RSVP info: RSVP online by April 10.